It’s April! Where is this year going, honestly? It is just speeding past at the speed of light and that doesn’t feel too good, right? So, it’s that time of the month again where we take a look back through my listening history and find out which song I have rated the most and the song that you should probably check out, if you haven’t already. So, one hit wonders? We have had loads over the years haven’t we? I can name “Mickey”, “Ice Ice Baby”, “Kung Fu Fighting” and “Who Let The Dogs Out” as some of the most famous one hit wonders out there in the universe. You may also remember that song from 2012, “Call Me Maybe” by that canadian chick, what was her name again? Oh yeah, Carly Rae Jepsen. That song ruled but where on earth did she disappear to? Another one of those one hit wonders to add to the list? Well, actually NO! Bom chicka wowa! Carly Rae Jepsen is not only back but she is back with a song that blows “Call Me Maybe” out of the ocean. Yes, I am talking about her new unexpected single “I Really Like You” which has been ruling the airwaves in my house recently. So don’t be calling Carly a one hit wonder because that is just not the truth at all. So, you may know the song for having the video starring the legendary actor Tom Hanks. Yes, not only is she back in business but she has lined up some proper A-List celebrity schnazz! Let’s watch that video right now, shall we? Now let’s take a look at the songs that missed out on being crowned song of the month. Here is the Top 5 in full. Carly really did beat everybody by a big margin. Fantastic. So, album of the month? Is this really going to be a surprise to any of you? I managed to secure tickets to go and see her in December which I am ecstatically happy about. 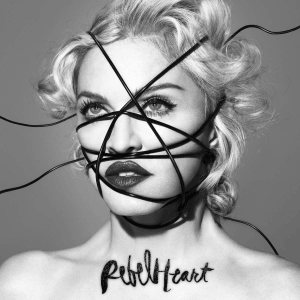 It is of course Madonna with her latest release “Rebel Heart”. This is also the second time this year this album has received the most amount of plays in one month, the last being in January. Will she do it again next month? Who knows! The album got a total of 172 plays (track total) last month. So tell me what you think. Are you digging “I Really Like You” as well? Is it better or worse than “Call Me Maybe”? Get in touch, interested to hear your views! The Eurovision’s Greatest Hits blog will be following shortly.